Amazed by artist Susan Dwyer's beautiful ceramic and papier-mâché works of art in her shop, up in the air somewhere (her pieces are surprisingly affordable, too). I love her work. I'm hoping she'll be at Renegade Chicago. I definitely see a Christmas gift for my mum. They're gorgeous! It's like there's a surprise inside every one! very impressive way to design these. Did you use pager, egg shell, tinfall? Sorry if I'm misreading the materials. They are beautiful they look so delicate! 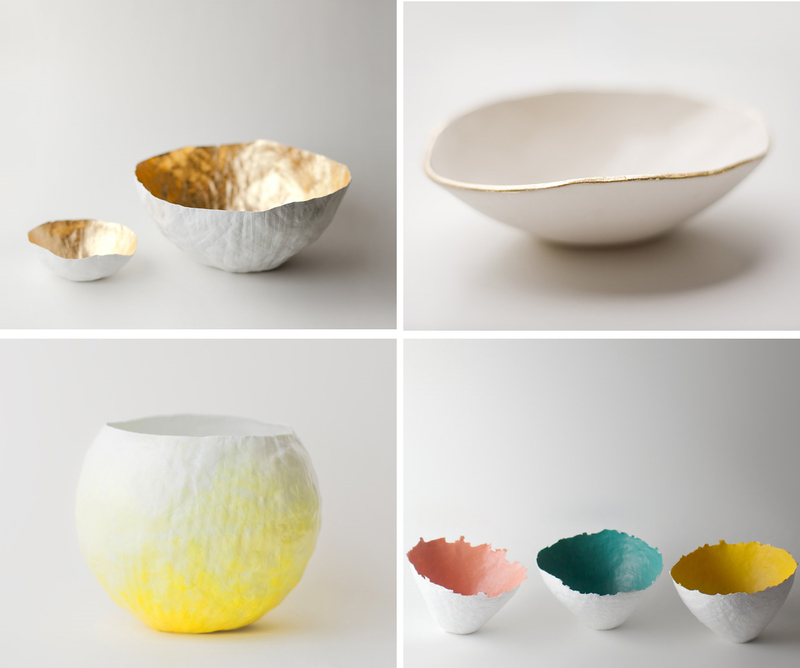 i love the white + gold bowl. wow. so stunning. these are gorgeous! especially the bowl with gold inside. thanks for sharing! I am so glad a) that I stumbled upon your blog - it's delightful! and b) that you posted about these. I posted about them a while ago, and then they just dipped off my radar for a bit. LOVE.